My trusted companion on all my Jungle trips is my spouse, but this time she had gone on for an offsite meeting from her office and I used the opportunity to take Sanjeev , an old friend from my PG days, along with me on a trip to Bandipur National Park. Sometime back Sanjeev gave up his lucrative IT job to follow his passion for photography. And I wanted to see the Jungle from the perspective of my portrait photographer friend. 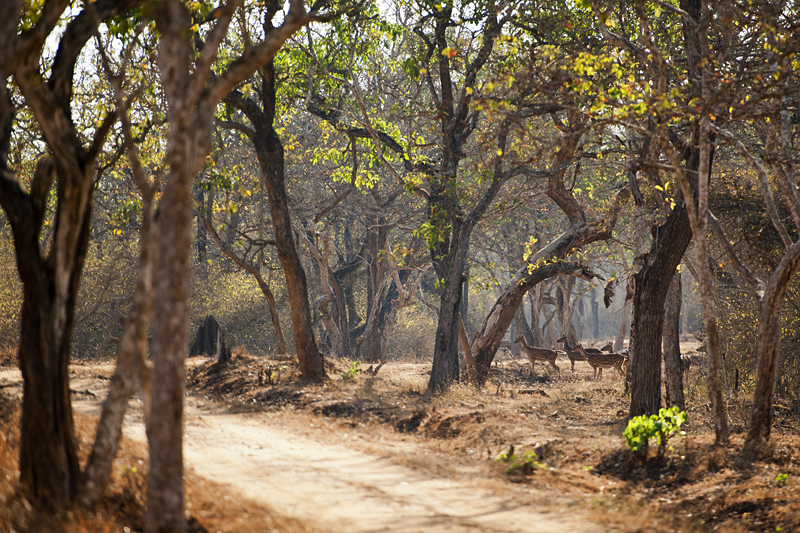 We were just about 10 minutes into our safari when we were stopped in our tracks by the hypnotic alarm calls of a herd of Chitals (Spotted Deer). The herd of Chitals (above) were right ahead along the safari tracks and their sights were trained at something in the Lantana on the other side. It was clear to us that it was either a Tiger or a Leopard. But in spite of searching for over 15 minutes, we could not spot the predator that probably had slipped away into the deeper Jungle. 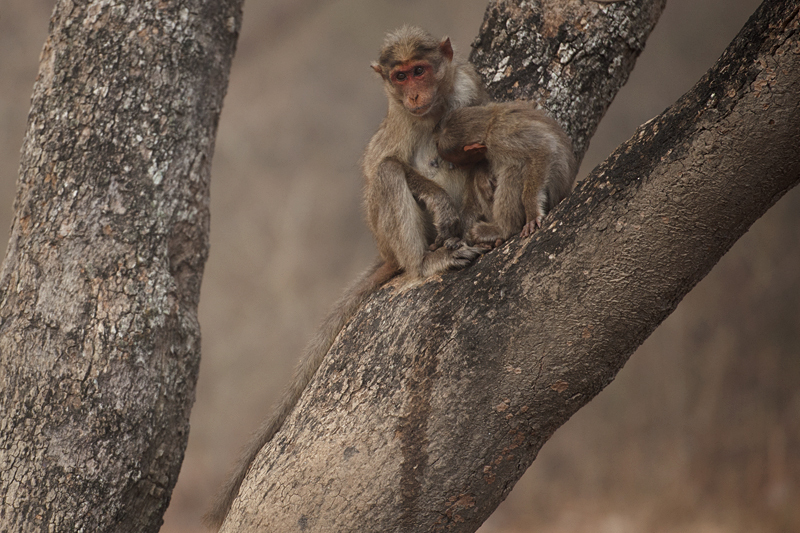 The next day’s morning safari was particularly cold and we saw a Macaque mother and her young huddled together for warmth. At one point the little fella started suckling and I captured the intimate moment (below). 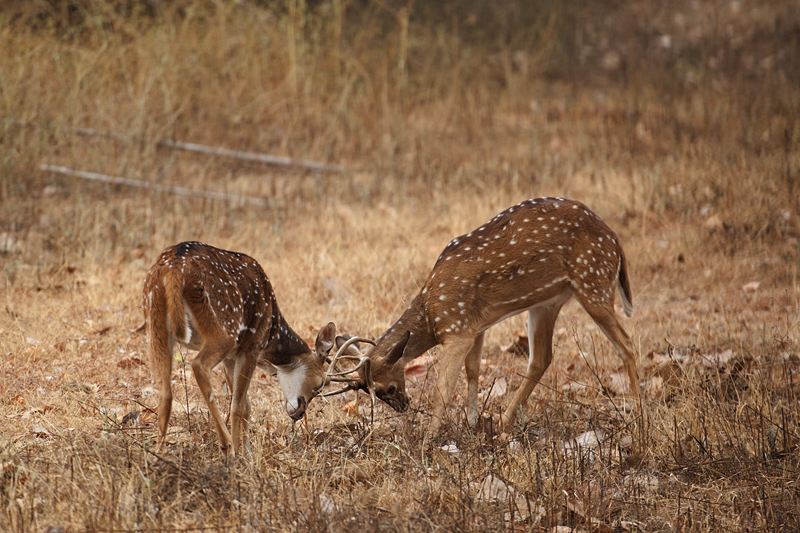 As we moved deeper into the park, we spotted a couple of Chital stags staging a sparring bout. While we were watching these sparring Chitals (above), we suddenly heard Chital alarm calls coming from the direction of a nearby waterhole and we dashed off in the hope of catching the glimpse of the predator. 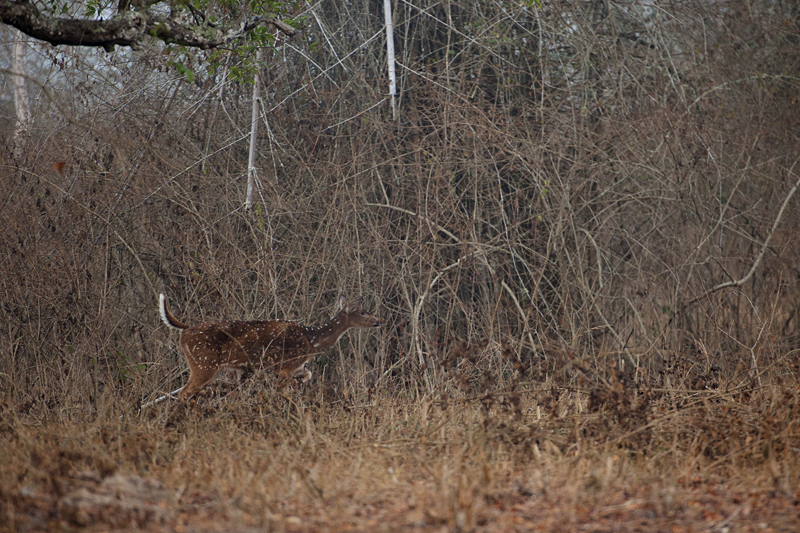 Once we traced the Chital (below) that was giving the alarm call, we hoped to spot the predator. But alas, as luck would have it, we once again missed out. My inference is that the predator would have quenched its thirst and disappeared into the Lantana hearing the approaching Jeep. We made it a point to come to this waterhole once again on the afternoon safari and try our luck at spotting this elusive predator. That afternoon was particularly hot and when we came to the waterhole, we found a couple of Peacocks foraging around it. We switched off the Jeep engine and decided to wait for sometime. A few minutes later a Barking Deer emerged from the forest cover, crossed the road to the waterhole, quenched its thirst and gingerly crossed back disappearing into the lantana. The hot afternoon sun and the utter calmness of the jungle was killing and we were contemplating to drive deeper into the Bandipur National Park. But almost instantly, we heard the alarm calls of a Barking Deer. Considering how close the call was, it was clear that it was the same Barking Deer that had crossed the safari tracks minutes ago. Everyone in the Jeep was searching through the dense undergrowth to try and single out the predator, that the Barking Deer had spotted. The Barking Deer was calling continuously for almost five minutes and yet we could not spot the reason behind the alarm call. Looked like we were going to be miss this predator again for the third time! And then all of a sudden, our naturalist spotted a slight movement in the Lantana and there he was, a mature adult Leopard, beautifully camouflaged (below) in the Lantana. After a few minutes it came closer to the edge of the Lantana bushes giving us a better view of this handsome predator. I captured the composition as the feature image for this post (first image). 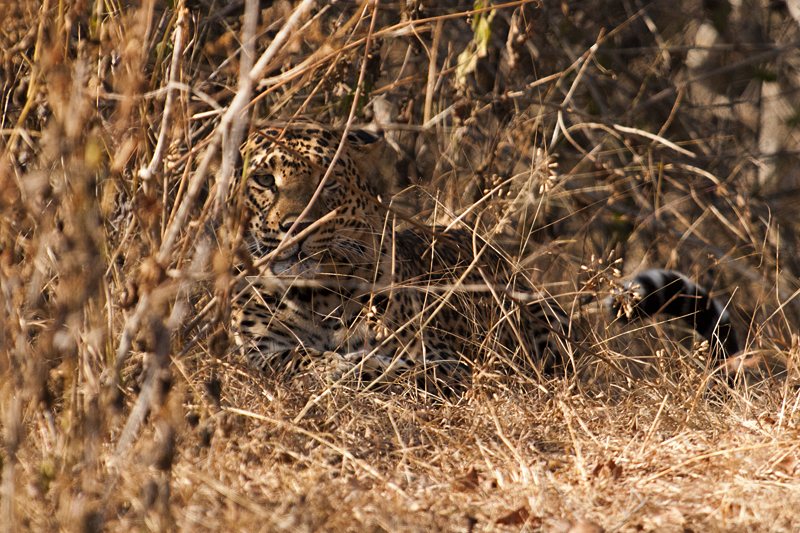 After a few minutes, the Leopard turned around and disappeared into the Lantana once again. Our best sighting of a Leopard was in Nagarhole National Park when a beautiful specimen crossed the road in front of us, climbed a rocky ledge called the Leopard rock and posed for us from there. You can read more about it in “Dream sighting of a Leopard”. Nice images. Good sighting despite the camouflage.